The Sendai Framework for Disaster Risk Reduction 2015-2030 (SFDRR) was finally agreed on 18th March following over 30 final hours of intense negotiations in Sendai, Japan. Amy Kirbyshire, a Research Programme Officer with CDKN, looks at the implications of the SFDRR for South Asia. We’ve had a month for the dust to settle on the new Sendai Framework for Disaster Risk Reduction, and there have since been some tentative celebrations amidst the often-critical commentary. The SFDRR has been compared favourably to the Hyogo Framework for Action (HFA) on many fronts, including for the enhanced role for science, and recognition of social processes and weak institutional arrangements as drivers of risk. While the seven agreed targets use ambiguous language such as ‘substantially reduce’, rather than numbers or percentages, it is notable that these are the first global targets ever created for disaster risk reduction (DRR). Concrete goals and targets were missing from the HFA. In the 10 years since the HFA was agreed in the shadow of the 2004 Indian Ocean tsunami, DRR has slowly risen up the political agenda. The negotiations in Sendai took place in a rather different political environment from those of the HFA. Some welcomed the politicisation of the process: in the long term, it should lead to increased political will to tackle the root causes of disasters. 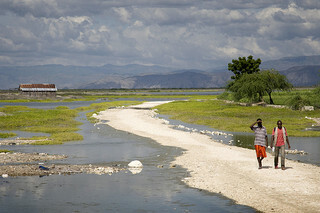 On the down side, the resulting SFDRR is relatively weak on finance promises for developing countries, doesn’t mention conflict despite the known correlation between disasters and conflict-affected states, and it lacks coherence with the Sustainable Development Goals (SDGs), among other weaknesses. The SFDRR clearly isn’t perfect, but we do have a new and improved global framework for tackling disaster risk. It is now up to national governments to put these words into action. As a first step, South Asian countries need to set ambitious, nationally-appropriate targets and tailor implementation to their circumstances. Netatua Pelesikoti, Climate Change Division Director at the Secretariat of the Pacific Regional Environment Programme recommended that South Asia could learn from experience in the Pacific. Here, the 2005 agreement was contextualised to enable the region to move forward with what is most important for Pacific countries. Our panel of experts shared the common sentiment that disaster risk must be tackled as a central pillar of development. Decision-makers should consider disaster risk in all new investments. By recognising weak institutional arrangements as drivers of risk and the need to strengthen ‘disaster risk governance’, the SFDRR supports that notion and offers an important guiding principle. South Asia has significant opportunities and challenges in that regard: South Asian countries are among the most at risk from disasters, but the region is rapidly urbanising and South Asian economies have seen tremendous growth in recent years. A significant amount of South Asia’s future infrastructure is yet to be built. Therefore, our experts agreed that the region should focus on ‘building better now’. That’s in addition to the ‘build back better’ principle in the SFDRR’s fourth Priority for Action – which refers to rebuilding after a disaster with more resilient infrastructure. Government funding for DRR needs to be mainstreamed within sectors, rather than channelled through vertical funds. This will help to ensure that DRR is part of regular activities, planning and investments across sectors, rather than remaining siloed and heavily projectised. Governments must enact and enforce laws to ensure that development investments across sectors are risk informed, for example building standards and the use of risk assessments in decision making processes. Our panel of South Asian experts agreed that it no longer makes sense to plan, invest in or implement DRR and climate change adaptation separately. The former is essentially to do the latter, as every DRR intervention needs to look 50+ years forward to ensure it stands the test of time. Unfortunately, although climate change is acknowledged in the SFDRR as a driver of disaster risk, the framework offers little guidance to governments to link DRR and adaptation planning and funding mechanisms. Actions highlighted include the use of climate change scenarios to inform risk assessments and maps, and collaboration across institutions for DRR and adaptation at all scales. As a first step, the panel recommended that governments establish joint committees or other mechanisms to bring together ministries responsible for adaptation, DRR and sectoral development to develop sectoral resilience strategies. Another suggestion came from the Pacific, where bringing DRR and adaptation under the bander of ‘risk reduction’ and omitting the word ‘disaster’ has aided such an integrated approach. The insurance industry is relatively weak in South Asia, and our panellists highlighted the need for development of this industry to support better risk management. The SFDRR itself says very little about risk transfer, risk sharing and insurance, beyond that such mechanisms should be promoted and strengthened at national levels with the support of the international community and other stakeholders. South Asia could learn from experience in Africa and the Caribbean, where the African Risk Capacity and Caribbean Catastrophe Risk Insurance Facility enable participating governments to pool risk as a mechanism to better manage regional disaster risk. This could be explored as an option in South Asia, but would require regional cooperation from governments. However, our panel also agreed that insurance cannot be allowed overtake risk reduction as the primary way to tackle risk. Reducing risk comes first, and insurance exists to help deal with residual risk as one part of a comprehensive disaster management system. In addition, given the little modelling done to date, there is a high first entry cost for the region, especially as South Asia is a complex, multi-hazard environment which is difficult and expensive to model. Finally, while the SFDRR itself places too little emphasis on domestic (compared to international) resources and improving national capacity to mobilise those resources, our panellists shared a strong feeling that countries in South Asia need to focus on helping themselves, rather than looking first to the international community for finance. A resilient national disaster management system needs to be self-reliant. Just to say, these are some of the useful points to build practical cases to implement SFDRR and quite nicely reflect the key South Asian views. Thanks.